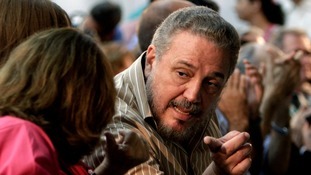 The nuclear physicist earned the nickname Little Fidel for his strong resemblance to his revolutionary Cuban father. A 21-gun salute was first sounded in the capital, Havana, as Castro's ashes were taken to the cemetery in eastern Cuba. The presidents of Venezuela and Bolivia will arrive in Cuba later on Tuesday to pay their respects to Fidel Castro. They will join thousands of people taking part in a rally in Havana to honour their former President and international icon. ITV News is in the capital and found even among Castro's greatest supporters there is a wish to change and modernise the country - but without doing anything to sacrifice the health and education systems he introduced. Kim Jong Un, leader of North Korea, has paid his respects to Fidel Castro, former leader of Cuba. 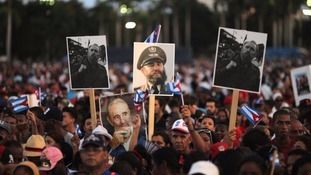 Thousands of people thronged around Havana's Revolution Square to honour their former revolutionary leader. Shadow foreign secretary Emily Thornberry will represent Labour at Tuesday's memorial in the Cuban capital city Havana. Will Trump reignite Cold War enmity between US and Cuba? Does Donald Trump's approach to Cuba mark a return to the former Cold War enmity between the two countries?